Mt. Blue boys hope to defend Class A title as well. Anyone wanting to knock off the Maranacook boys Nordic team might need to make it a two-year plan. It doesn’t look like the Black Bears are ready to concede any hardware anytime soon. Maranacook rolled to the Class B boys title last season, its second straight, and the heavy hitters are back at Readfield. Coach Steve DeAngelis has won enough championships to know that nothing’s a done deal in December, but he also can recognize a good situation when he sees it. It’s a group that is led by Luke Bartol, the second-place finisher in Class B in both the freestyle and classical races, but also consists of Carter McPhedran (fifth classical, eighth freestyle), Gabe Fein (ninth in both) and Tate Mendall (11th classical, 15th freestyle). There are also skiers like Bryce Trefethen, Will Colvin, Ethan Watts and Nate Janell who are looking to climb up the Maranacook ladder this season. The girls aren’t the state favorite the boys are, but a group led by juniors Maura Taylor, Ashley Cray and Cambelle Nutting should still fare well. Hopes are high for the Mt. Blue boys as well after the Cougars skied their way to the championship in Class A. Sam Smith is back after posting top-10 finishes in the classical and freestyle, as are Jesse Dalton and Mick Gurney after top-10s in the classical and Dominic Giampietro after doing the same in the skate. The girls team lost some valuable seniors from last season’s third-place team, but Polfus is excited by the newcomers arriving this season. Chelsea Seabold, Gretchen Huish and Kahryn Cullenberg still provide a good core, but new skiers like freshmen Emma Charles and Brynne Robbins should contribute as well. Monmouth has one skier in Kyle Gunnells, who was sixth in the Class C freestyle and eighth in the classical, and the senior will practice with Leavitt while Mustangs coach Chris Bryant will work with him. Mt. Blue is looking to take another step after sixth-place and fifth-place finishes for the boys and girls, respectively, in Class A. The Cougars have a good core coming back on the boys side, with Sam Smith, Eli Yeaton and Jack Kearing all showing the potential to be top-10 racers. Don’t be surprised to see freshmen Josh Smith — Sam’s younger brother — and Ashton Beaudoin post some impressive finishes as well. Coach Mark Cyr likes the group, particularly its aggressiveness. Ski racing requires a lack of caution, and he said the top skiers have shown it. 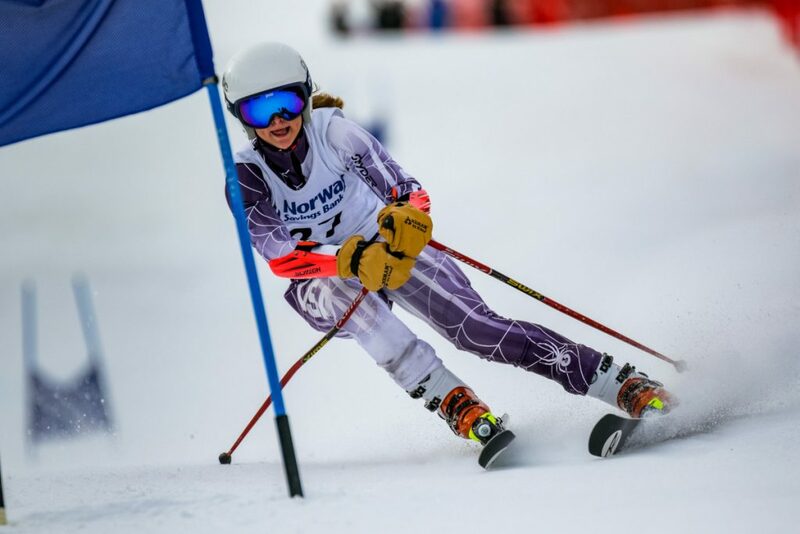 The girls team has plenty of returning talent as well, particularly in Ellie Pelletier (third in the giant slalom) and Jenna Hanrahan (12th), but this time, Cyr is hoping to see some of that same aggressiveness as the Cougars try to translate talent into high states finishes. The Maranacook girls won the KVAC championship en route to a third-place finish in Class B. The Black Bears bring back a deep junior class led by Katie Ide, who was fourth in the slalom at the state meet last year, while senior Lily Welch and junior Dana Reynolds are also looking for big winters. The boys team is led by Robbie McKee, who was third in the Class B giant slalom, and will be looking to challenge for the KVAC’s top spot. 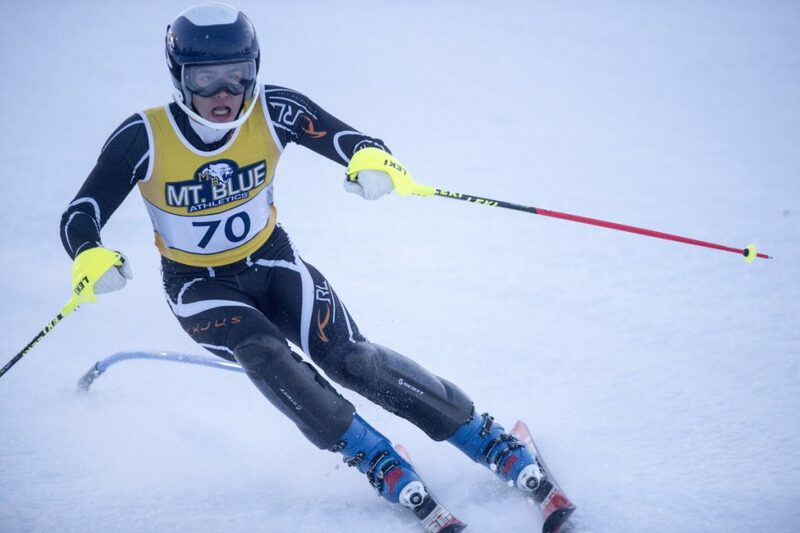 “It will be an exciting season ahead for the boys’ squad as this committed group hits the slopes,” said Gifford, who is also coaching Winthrop’s Maguire Anuszewski (top-10 in both giant slalom and slalom) and Gardiner’s Sarah Foust and Susie Strickland. Mt. Abram is hurting for numbers, as only four skiers, all girls, came out. Alice MacKay is looking to be a top-15 skier in both the slalom and giant slalom, and Lydia Dicentes, Yvonne Provencher and Celeste Reid are talented as well. It only takes a fall or two in the finals meet to derail the season, but all things being equal the Kents Hill boys team should win a MAISAD title for the third year in a row. Senior Iassa Bell placed second in the league championship and later seventh in the New England meet. Coupled with junior Michael Fontaine (fourth at MAISAD), this gives the Huskies a strong 1-2 combination. Graham Hannon, Zach Knowlton and freshman Jackson Melendy add quality depth to the Huskies. Bell expects strong competition from Hebron and Gould Academies. The girls team, led by senior Rebecca Penzer, lacks overall experience. “We’ll just get some experience and have some fun,” Bell said.